At this point your new radius authentication server is installed and will now restart and boot. After the reboot is complete will find out the machine's IP address so we can administer it. 15) After it has rebooted, log into the machine with username root and password you created before. Administration of the system is done through a web page. Some users will want to enable this page to be viewed over the local network. By default it is not done, meaning you need physical access to the machine it is running on to add users etc. If you Don't want to enable remote viewing of the web interface skip this section. Click the disk icon on the top left to save it and now close that window. This will restart the web server and re read the file we just edited and all access to the web interface from the local network. I) Using your web browser point it to the IP address if your machine. Replace 192.168.0.15 with your IP address. The following will set up a single user and NAS device. 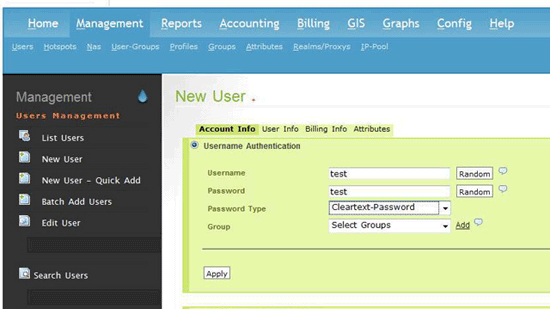 17) Go to management > user > new user and enter a username and password of your choice. Make sure to select Cleartext-Password as the type. After you're done, click Apply. 18) Go to Management > NAS > new NAS. B) Create a password in NAS Secret. C) NAS Type = other (unless your using a Cisco AP choose other). 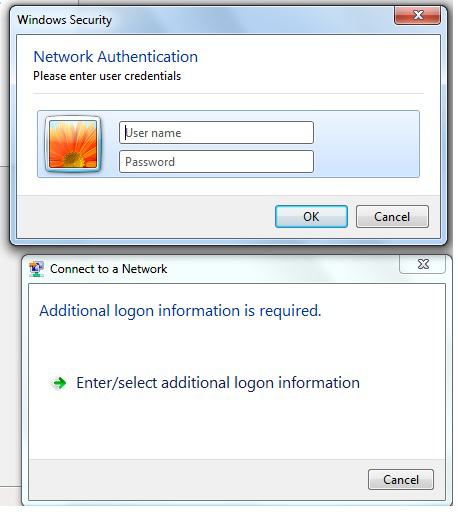 Now we're done here, we need to log into the access point / router and make it use the new authentication server. 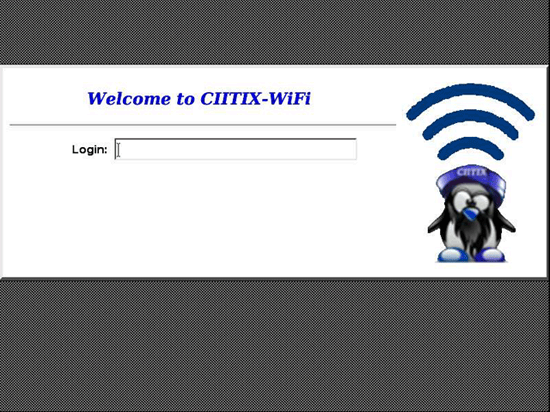 The following screenshots used here are from a D-Link DAP-1150 access point. Practically all access points are the same, you will need to find where yours keeps these settings. 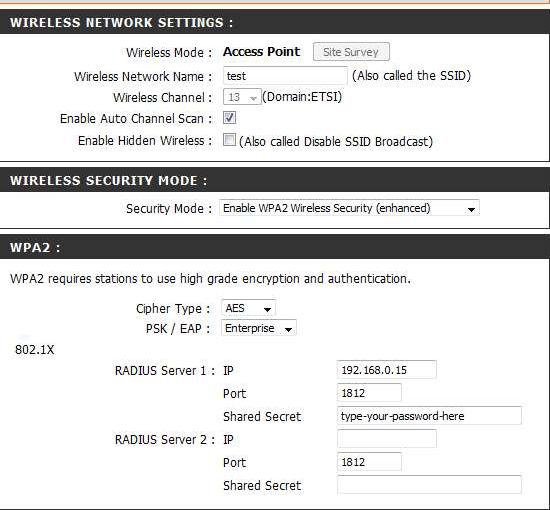 What we need to do is make it use WPA or WPA2 enterprise and specify the radius server, that's it. 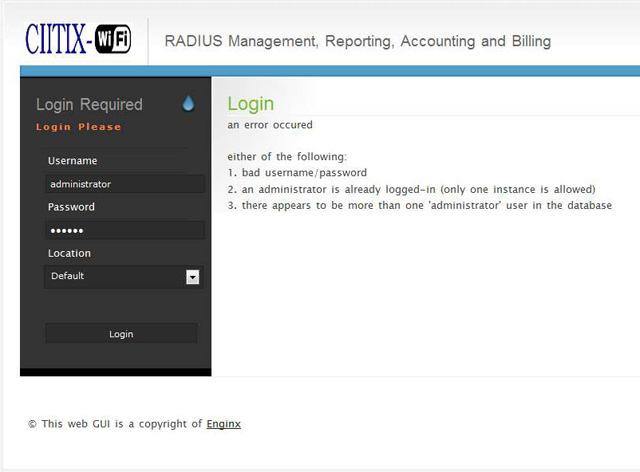 The radius server IP is the IP address of the CIITIX-WiFi server and the port is always 1812 and the shared secret is the password you created when we were adding a NAS device. You will see two file in there. Copy these to your desktop, you can drag and drop these from WinSCP. It makes good sense to copy these to a USB flash drive for ease of installation on other PC's. Check out previous steps on where to get and how to use WinSCP. With Windows 7 you can double click on one of these certificates and an installation wizard will appear to guide you. Make sure you specify to install them in trusted root certificates the same goes for windows XP, Vista. Now upon trying to connect to the wireless network you will be prompted for a password. Enter the username and password you created in the 'users' section in the web management and that's it. The password for the certificate when installing is ciitixwifi your done! 2) Double click on server certificate > click next > click next > enter password ciitixwifi > click next > place all in following store > browse > trusted root ca > ok > next > finish. That's it. When you try to connect to the WiFi network it will use the certificate automatically and ask for a user name and password as pictured below. 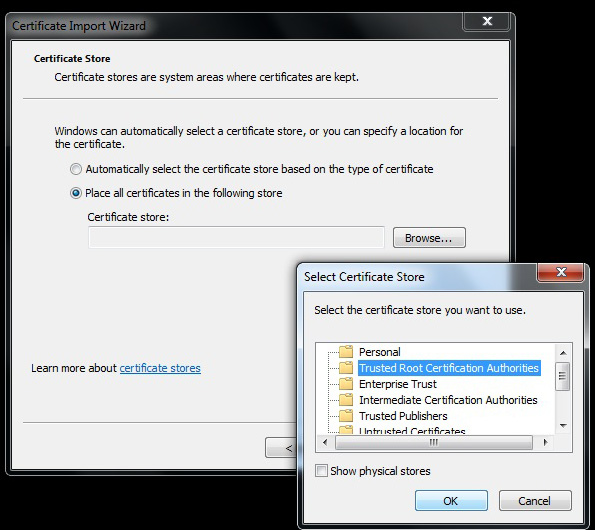 Windows might complain upon the first time using the certificate. This is normal and it won't ask you gain after the first time. Its because its a self signed certificate from your CIITIX-WiFi server. Iphone and Ipad devices will automatically obtain the certificates from the server. You do not need to install these manually. Linux users will need to Install the certificates, there are many flavours of Linux, but some distros such as Linux Mint which is Ubuntu based can install the certificates by double clicking on them. Again a wizard appears to guide you. Other devices which are run an embedded OS such as the Nintendo Wii for example may not be compatible with Enterprise Authentication. You should see the administrator user. Click on it & on prompt change/enter the new password. after enabling the web interface where can I change the administrator password ?